LONDON, Jul 25, 2018 - (ACN Newswire) - WARC, the global authority on advertising and media effectiveness, has today released the results of its recent worldwide survey of senior strategists, highlighting their challenges and the impact the strategic function is having on the ever-changing marketing landscape. 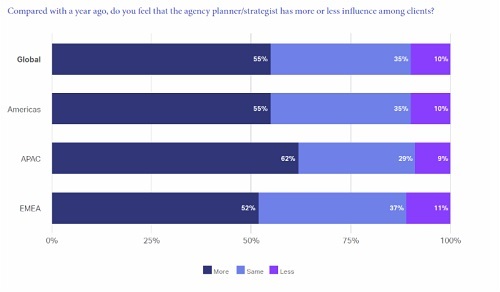 More than half of strategists and planners expect their teams to grow over the next year, in an era when most feel that the influence of planning is growing both within their agency and among clients. Despite this optimism, there is a feeling that planners' skills are not always being applied most effectively, commonly attributed to the pace of change in the industry, and a client focus on tech rather than sustainable strategy. Shekhar Deshpande, Global Planning Director & Strategy Consulting Director, J Walter Thompson, comments: "Senior clients want more strategy, perhaps to help them navigate the current marketing labyrinth, and become better marketers." Budget pressures are a clear obstacle for planners and strategists globally. The majority of respondents in all regions say client-side budget cuts are having an impact on strategy teams. This is leading to more short-term thinking by clients. Within agencies, it means lower budgets and planners who no longer feel able to spend time away from their desks. Rob Campbell, Chief Strategy Officer, Deutsch, observes: "Fewer and fewer planners spend much time in the real world, preferring to observe it from the comfort of a research report and Google search." Marketing strategy is no longer just an agency specialism; increasingly strategy is being offered by consultancies, by tech and media firms, or by in-house client teams. That means greater competition for agency planning teams; but it may also mean more varied career opportunities for individual planners. Dan Burdett, Chief Marketing Innovation, Officer, EMEA, eBay, raises the question: "In a world where everybody is in some way competing with the guys in Seattle, how do we form coalitions that are going to benefit all of our businesses and help drive the industry forward?" 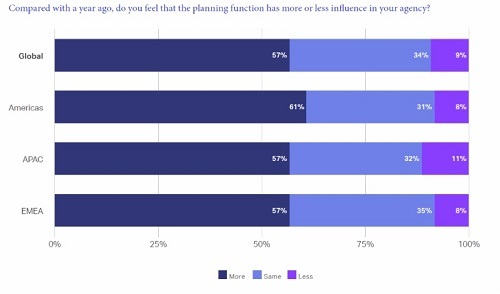 There is a tension between where planners want to be playing - on upstream business problems - and the reality of their day-to-day roles, with, in many cases, limited access to client data and heightened focus on tactical campaign elements. Reflecting the different visions of strategy in the industry and the potential need for reinvention in marketing services, several respondents argue that a link between strategy and execution remains vital. Paula Bloodworth, Brand Strategy Director, Wieden + Kennedy, London, comments: "With consumers moving and changing so quickly, we should be more executional in the way we plan and be nimble and flexible and adaptive." Summing, David Tiltman, Head of Content, WARC, says: "WARC's 2018 Future of Strategy report reveals a discipline in flux. There is generally a feeling of optimism - of greater influence and growing teams. But that is undermined by the impact of client budget cuts and, more broadly, a sense that the planners and strategists are not thriving as they might in current agency structures, at a time when competition for strategic services is growing." A preview of the Future of Strategy report was unveiled during WARC Day at this year's Cannes Lions International Festival of Creativity in June, with insights shared by senior global strategists. View the highlights video on www.youtube.com/watch?v=NAnSzNq6r1g. A sample of the report is available to download from https://content.warc.com/read-the-warc-future-of-strategy-2018-sample-report and a free-to- join webinar discussing the findings of The Future of Strategy report will take place mid-August. The full report, including additional data, analysis and exclusive commentaries from senior survey participants, is available to WARC subscribers on www.warc.com/Welcome. warc.com is an online service offering advertising best practice, evidence, insights and data from the world's leading brands. WARC helps clients grow their businesses by using proven approaches to maximise advertising effectiveness. WARC's clients include the world's largest advertising and media agencies, research companies, advertisers, market analysts and academics. Founded in 1985, WARC has offices in the UK, U.S. and Singapore. In June 2018 WARC was acquired by Ascential plc, the global specialist information company.